Three Murfreesboro Camp #33 December events! Saturday December 8th Eagleville Christmas parade 11:00 amstart time. Be at the Eagleville High school by 9:30 am and ride on the float to the staging area lot at North Main and Oak street. This way when the parade ends you will be back at your vehicle. “A Tennessee Christmas” is the theme for the parade. Period dress or Confederate uniform will be marching and everyone else can ride on the float. Sunday December 9th, Murfreesboro Christmas parade 2:00 pmstart time. Be at the Rutherford County court clerk’s office, 319 North Maple street, by 10:30 am and ride the float to the staging area at the MTSU parking lot on Rutherford Blvd which is across from Alumni drive. Line up and starting point is Alumni drive. “A Christmas Story” is the theme for the parade. Period dress or Confederate uniform will be marching and everyone else can ride on the float. 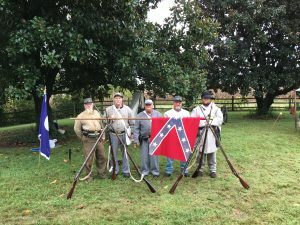 Battle of Murfreesboro memorial service, Sunday December 30, 2018. The annual Battle of Murfreesboro memorial service will be held at the Confederate Circle in Evergreen cemetery, 519 Greenland Drive, on Sunday December 30th, 1:00 pm. The Confederate flag that flies over 2,000 Confederate dead will be changed out during this ceremony. 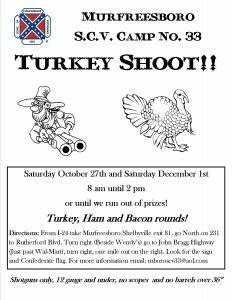 Confederate Reenactors are welcomed to participate bring your full gear and be prepared to fire a musket salute. The public is invited.